The map is called: Carta Geografica Completa di tutti i Regni del Mondo. It was drawn up in 1602 at Peking by the Macerata born Matteo Ricci (1552-1610), Jesuit father founder of the Catholic mission in China. We read in Pasquale D’Elia - sinologist at the University of Rome who in 1958 certified the authenticity of the Chinese maps in this museum’s possession (see op. cit.) - that "it is the third edition of a geographical and cartographical work that made him famous throughout China. [Ricci] had already made a first edition in 1584 at Shiuhing, followed by a second in 1600 at Nanking, and two years later a third in Peking, where he had finally arrived on 24 January 1601." There are only a few exemplars of these maps in the world. Of the third edition of 1602, printed on rice paper, only another six exemplars are known of: two at the Vatican Library, three at libraries and national archives in Japan (Tokyo, Miyagi and Kyoto), one in a private collection (Schiller). Six other exemplars of subsequent versions of Matteo Ricci’s map can be found in Korea, China, London and Vienna and one was recently discovered in the store-rooms of the Shenyang Museum in China. A world search is currently in progress by Kendall Whaling Museum of Massachusetts. 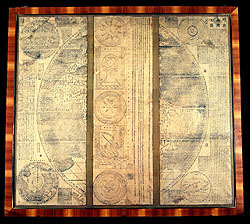 The Bologna Specola is only in possessesion of the two outer sections - of the total six which made up the complete map, 4.14 m long - which show the coasts of Brazil on one side and those of Africa with Spain, France and Ireland on the other. During restoration a few decades ago a central fragment, that is part of the Doppio Emisfero delle Stelle by the German mathematician and astronomer Johann Adam Schall von Bell [file 66], was wrongly inserted between the two sections. In 1938, edited by the Biblioteca Apostolica Vaticana, an exhaustive work by Pasquale d’Elia was published with comments, notes and translation of the whole map. This and the other celestial map are of great importance for the evidence they offer on the development of map-making in the XVI and XVIIth centuries and the influence of Western thought in China in that same period. The maps carry plentiful instructions for use and detailed illustrations of the instruments that went into their production, as well as explanations regarding conceptions of "systems of the terrestrial and celestial world". "Once I thought learning was a multifold experience and I would not refuse to travel [even] ten thousand Li to be able to question wise men and visit celebrated countries. But how long is a man’s life? It is certain that many years are needed to acquire a complete science, based on a vast number of observations: and that’s where one becomes old without the time to make use of this science. Is this not a painful thing? And this is why I put great store by [geographical] maps and history: history for fixing [these observations], and maps for handing them on [to future generations]. Respect fully written by the European Matteo Ricci on 17 August, 1602." To the left of the title the figure of the Nove Cieli (Nine Skies) can be made out, illustrated as per XVIth-century conceptions, and the accompanying inscription explains the movement of the planets. Some other inscriptions in the right-hand section, on the other hand, offer general ideas on geography and oceanography. Another inscription records an extract of the Storia dei Mongoli regarding the motions of the Sun. In the left-hand section, at the top, there is an explanation of eclipses and the method for measuring the Earth and the Moon. Both sections carry the characteristic seal IHS of the Compagnia di Gesù, while at bottom left, in the southern hemisphere, one can see the name of the Chinese man who did the printing and the date: "one day of the first month of autumn in the year 1602". Nothing is known about where this relic came from. One hypothesis is that it reached Bologna via the Jesuit Giovan Battista Riccioli (1598-1671), professor of humanities, philosophy, theology and astronomy, first at Parma, then Bologna: his works do in fact speak of Matteo Ricci and Chinese astronomy. For a detailed description and bibliography of the map see the works of father Pasquale D’Elia (op. cit.). B. Szczesniak (1967), p. 127.